Deira (a prime area), east of the creek, is Dubai’s commercial hub, although it also teems with middle-class apartment buildings, government offices, foreign embassies and banks. 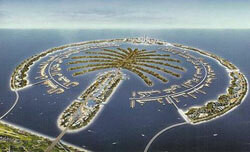 It is Dubai’s major point of entry, hosting the Dubai International Airport and the vast Dubai Duty-Free zone. Deira is home to Dubai’s first seaport. Old-fashioned Arab wooden ships (dhows) regularly make Deira their port of call, and its Dhow Wharfage is a popular tourist attraction. Less urbanized than Bur Dubai, Deira has some old-world charm, in its narrow winding streets and small family dwellings, local eateries, and small shops, dwarfed by the modern high-rises on the horizon. At the Gold Souk, more than 700 shops sell jewellery. Gold prices here are said to be among the lowest worldwide. Nearby is the Spice Souk, Deira’s oldest market, where herbs, spices and scents are sold, plus textiles, crafts and rugs. Deira’s Al Hamriya Port (not to be confused with Port Hamriya in Bur Dubai) borders the Deira Corniche, the gateway to the Palm Islands. 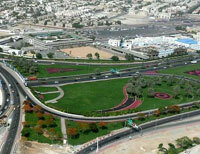 It is south of the Al Mamzar beach park, a popular destination for nature lovers. Umm Ramool’s buildings are all low-rise, as it is near Dubai International Airport. There are residential apartments, plus shops and corporate offices related to transport, air cargo and travel services. Two large companies here are the construction giant Al Habtoor and the trade conglomerate Al Futtaim. New developments are being planned in Umm Ramool, due to its strategic location. Al-Baraha is a mostly residential community south of the waterfront Deira Corniche, a tourist and commercial area right beside the Persian Gulf, with a broad walkway toward the Dubai Creek. A number of hospitals are here, such as the modern Belhoul Speciality Hospital, the government’s Dubai Hospital and the Al Baraha Hospital, one of the three government medical centres used by private firms. Al Garhoud, west of Umm Ramool, is a residential area popular with airline crews. Emirates airline has its aviation school here. Those who often travel in and out of Dubai sometimes choose to live in Al Garhoud, which offers large residential villas with gardens, and modern apartment buildings. The huge and popular shopping complex, the Deira City Centre, is just ten minutes away. Other attractions are the Aviation Club and the Irish Village, which has Dubai’s largest beer garden. East of Al-Garhoud lies the small but dynamic Port Saeed, always crowded with dhows and other small shipping boats plying the Dubai Creek. Near the port is a business and commercial area, with a few residential and tourist accommodations. The local government is redeveloping the area, to expand the residential portion and add more office and commercial buildings. The project will include Port Saeed Plaza, a leisure and entertainment area with open-air venues, water areas and shaded playgrounds. Al Rigga, in the central portion of Deira, is vibrant and ever-busy. A major shopping and tourist destination, Al Rigga comes alive during the month-long Dubai Shopping Festival every year. Dubai’s oldest shopping mall, Al Ghurair Retail Centre, is on Al Rigga Road. There are five-star hotels, affordable hotels, and serviced apartments. Al Rigga Road is popular for dining, especially restaurants offering Arab and Asian cuisine. The Dubai International Airport is ten to 15 minutes away. Muhaisnah and Naif are residential communities for foreign labourers and Deira’s most densely-packed areas. Naif used to have one of Dubai’s oldest souks, until it was razed by fire in 2008. Local officials are rebuilding it.